Mineral deposits are spots of minerals that are left behind after the carrier has evaporated. Although the liquid evaporates, the minerals in that liquid don’t. They are left behind. When water evaporates (it doesn’t have to boil to evaporate) it leaves behind many if not all of these substances. 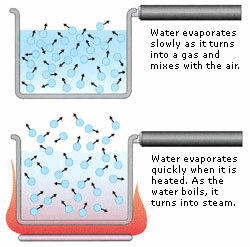 Evaporation is a different process to boiling. The first is a surface effect that happens at any time, while the latter is a bulk transformation that only happens when the conditions are correct. 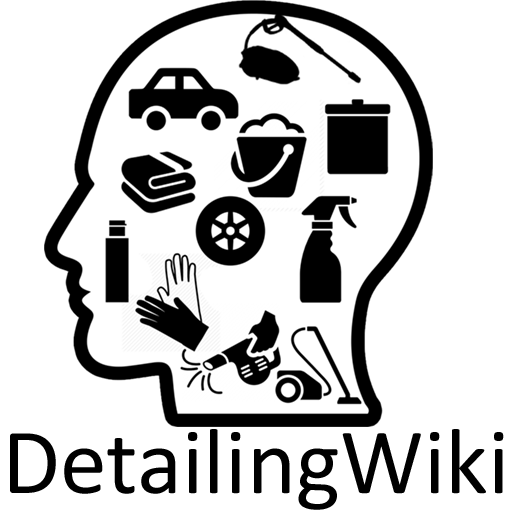 Technically the water is not turning into a gas, but random movement of the surface molecules allows some of them enough energy to escape from the surface into the air. The rate at which they leave the surface depends on a number of factors – for instance the temperature of both air and water, the humidity of the air, and the size of the surface exposed. When the bridge is ‘steaming’: the wood is marginally warmer than the air (due to the sun shine), the air is very humid (it has just been raining) and the water is spread out to expose a very large surface area. In fact, since the air is cooler and almost saturated with water, the molecules of water are almost immediately condensing into micro-droplets in the air – which is why you can see them. After the water has evaporated, certain substances are being left behind. These substances form a small layer. When a droplet forms on a car, the round shape helps the sunlight to be directed just like a magnifying glass. Heating up the surface underneath and warming up the droplet even more. The faster the droplet evaporates, the more substances are left behind. The combination of directed sunlight with the amount of substances in the water droplet, can actually cause a slight etching effect, which can later be seen as very small ‘drop-like’ imperfections in the surface that can only be polished out. In very extreme cases, these imperfection can’t be polished out and might need a respray. The shape of the bead makes it fairly big in volume with a relative small surface. This causes the droplet to evaporate less quickly then a flat puddle of water. It is very common to still see drops of water on a car with great beading, even though the unprotected car next to it is already completely dry. Ironically, waterspots can be lessened by preventing nice, full, round beads. The greater the complete wetting-effect, the smaller the risk of mineral deposits and the quicker the water will ‘dry up’. It is not to difficult to have more control over mineral deposits. In most cases just washing the car regularly will remove the largest of them. In some more rare cases you can use the claying-process to remove them safely. The effect they have on the paintwork might need polishing to remove. In very extreme cases it might need a respray or spot repair. In general, most products aren’t affected very much by waterspots. However, ceramic coatings have a tendency to be much more prone to waterspots because of their chemical make-up. This can sometimes be prevented by applying a spray sealant which is based on the same ingredients, polymers or overall technology.